Photo and caption by @LACoPublicWorks (social media account). 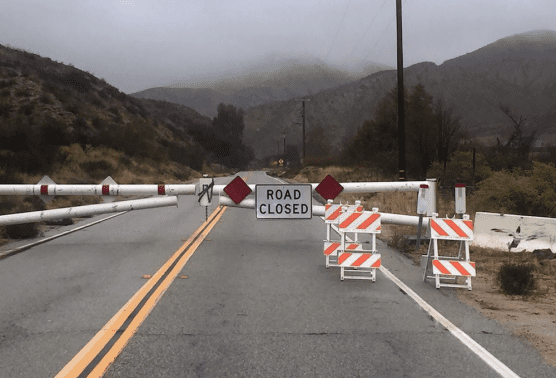 #RoadClosure Update: Bouquet Canyon Road in the Angeles National Forest will be closed due to moderate to heavy rain Tuesday, Jan. 15 at 2 p.m. through Thursday, Jan. 17. Periods of very heavy rain are expected to develop and continue through this evening as another strong storm system moves into the area. There is a elevated risk of flash flooding and mud and debris flows in and around recent burn areas in the watch area. n addition, roadway flooding is likely, especially in low lying areas, along with rock and mudslides on canyon roads and below steep terrain. Bouquet and San Francisquito do not intersect; in the recent past, Bouquet has been closed at Vasquez Canyon Road. For an update on road closures, please see dpw.lacounty.gov. Bouquet and San Francisquito don’t cross or meet anyplace. Where are you actually reporting about? Maybe they meant Vasquez Canyon and Bouquet Canyon. That is where they usually shut it down. The picture associated with the headline sure looks like Sand Canyon Road at the old Live Oak Campground to me.